Forsythkid: Library and Lions Club Team Up in Sightful Success! Library and Lions Club Team Up in Sightful Success! Capping off National Library Week, Taneyhills Community Library teamed up with Lions KidSight USA Foundation last Saturday to hold free eye screenings for kids. 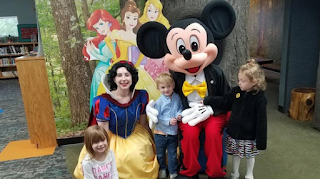 The highlight of the day for children and adults was seeing Mickey Mouse and Snow White, who visited the Stanley and Elaine Ball Children's Library. Attendees were able to have their pictures taken with their favorite cartoon characters, enter a library drawing, and win prizes. Taneyhills hopes to team up with KidSight again to provide this free opportunity to the community. CDC: Measles at highest levels in 20 years! BBQ Chicken drumsticks in a convection oven! A DanO burger at the Park! Foriegner with I've been waiting! A baked potato with sour cream! Tipping. And is 20% enough? From Pawnee Bill to the Moon and Back! All data and information provided on this site is for informational purposes only. The owner of this blog makes no representations as to accuracy, completeness, currentness, suitability, or validity of any information on this site and will not be liable for any errors, omissions, or delays in this information or any losses, injuries, or damages arising from its display or use. All information is provided on an as-is basis. Critique of Banquet’s Mexican Style Chicken Enchilada Meal! Weight differences between cooked and dry pasta? Protesters gather in front of Taney courthouse! Making a rump roast in a slow cooker! Death of person found by Shadowrock may have been accidental or not! Critique: Banquet Salisbury Steak Meal! An afternoon at the Mug!